In The Netherlands we drive on the right side of the road unlike for example the UK where they drive on the left side of the road. If you are not used to driving on the right side, I highly suggest to be very carefull and be extra alert. Common mistakes that are made in this case are driving a roundabout in the wrong direction and drive on the wrong side of the road when there is no other traffic (you fall back in your normal way of driving). If you do not feel confident enough to drive around the public transportation in The Netherlands is of a high quality and can get you everywhere in the country. When driving you should always have your driving license with you and of course the papers of your car and insurance. Driving around is free as there are no toll roads or vignets you need to buy. The Dutch have very well maintained roads and it should also be easy to navigate as all localities and other major destinations as theme parks are clearly marked on the road signs. When there are roadworks the diversion is clearly marked and should be easy to follow, otherwise just follow the car in front of you and hope he is following the diversion (something I do when in doubt). It has been put to my attention that roads in The Netherlands are sometimes to be found a bit narrow by foreigners. If you make a traffic violation and get stopped by a police officer you will be have to pay the fine immediately as a foreigner (residents of The Netherlands will get the fine sent to their homes). This is because they cannot collect if you just don’t pay and are back in your own country again. Therefore it is good to always have some cash money in your wallet, something which is always usefull in case of emergencies in my opinion. But the best thing is to make sure you follow the traffic rules and speed limits (but of course everyone can make a mistake). 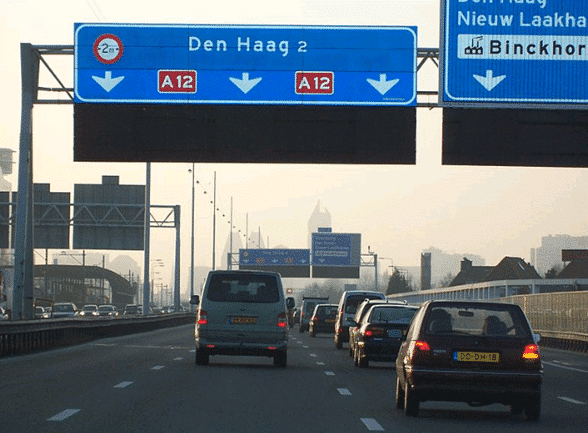 Generally speaking the Dutch are very polite drivers compared to most countries. You will not see or hear the excessive honking and signaling I sometimes see in other countries and other drivers will stop when you have priority. Of course there is the occassional tailgater and annoying driver, but I guess we’ll see that everywhere in the world. When you see a car with the letter ‘L’ on it, it means this is a car used by a driving instructor and his student (student driving). The speed limit inside the built-up area is normally 50 and outside on single carriageways it’s 80. On Dual carriageways it’s 100 and on the highway/motorway 130. These are the limits unless otherwise indicated, and this is often the case.